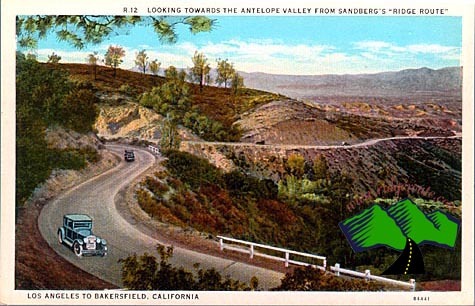 Located near the intersection of Pine Canyon road and the Old Ridge Route just south of highway 138 at an elevation of 4,170 feet. 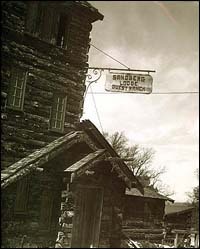 The hotel was built by Harald Sandberg in 1914 and was ready when the highway opened in 1915. Originally a one story log structure. Later it was enlarged to a three-story building. The first floor held a dinning room, public room with a large fireplace and a post office. The second story was the living quarters for the Sandberg family. The third floor contained guestrooms for the weary travelers. The hotel catered to the "carriage trade." This is where you would see the Cadillacs, Packards and Studebakers. The hotel was on leased National Forest property and after Mr. Sandbergs death various people assumed the lease to maintain the hotel. 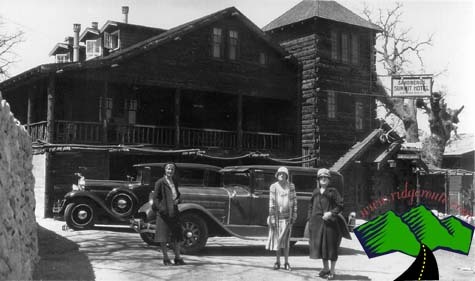 When the Ridge Alternate opened in 1933 Sandberg's was one of the few remaining Inn's that remained open. Unfortunately with little traffic, the hotel closed. The last operator of the lease was a Mr. Walter "Lucky" Stevens. He had plans to renovate the property and turn it into a children's camp. Unfortunately during renovation, sparks from the fireplace ignited the roof and the hotel burned to the ground on April 29,1961. All that remains today are foundations and a rock wall on the West Side of the old road just prior to entering the Angeles National Forest and unmaintained section of road.